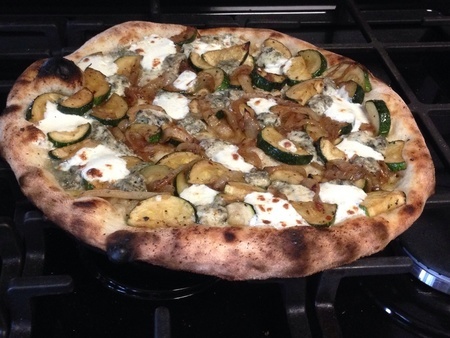 Roasted garlic, olive oil, zucchini, caramelized onion, Gorgonzola and homemade mozzarella. This is amazing Steve. One of my go-to places near me makes a white pie with Zucchini and Feta. However, this takes the cake. The caramelized onions are a nice touch. The char on that pie is perfect. Thanks Raj! Its all in the dough and the high heat of the cleaning cycle.